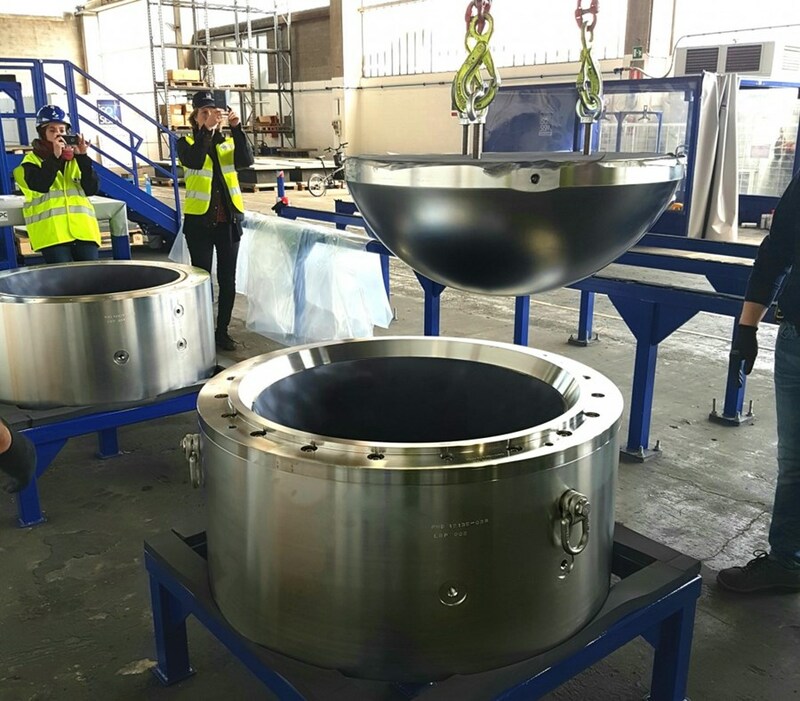 They are the jewels of the concrete crown that will support the combined mass of the Tokamak and its surrounding cryostat: 18 perfectly polished, chrome-plated spherical bearings, each weighing approximately 5 tonnes. The ''jewels'' of the ITER cryostat crown (seen here upside down): 18 bearings that will support the 23,000 tonnes of Tokamak and cryostat. The 18 cryostat support bearings will act like ball-and-socket joints to allow the smooth transfer of the tremendous forces that will be exerted on the machine in all types of situations—normal operations, vertical displacement events or even an earthquake. Following the production and validation of a series of models (one-fourth, one-half and actual size) the ITER contractor FPC-Nuvia launched the manufacturing process for the actual bearings in January. Twenty bearings will be produced, 18 to be inserted into the supporting crown and two spares. Late in March, Laurent Patisson and Armand Gjoklaj of the ITER Building & Civil Works Section took a trip to Montebello, near Padua, Italy, where FPC-Nuvia is assembling the first cryostat bearings of the series. 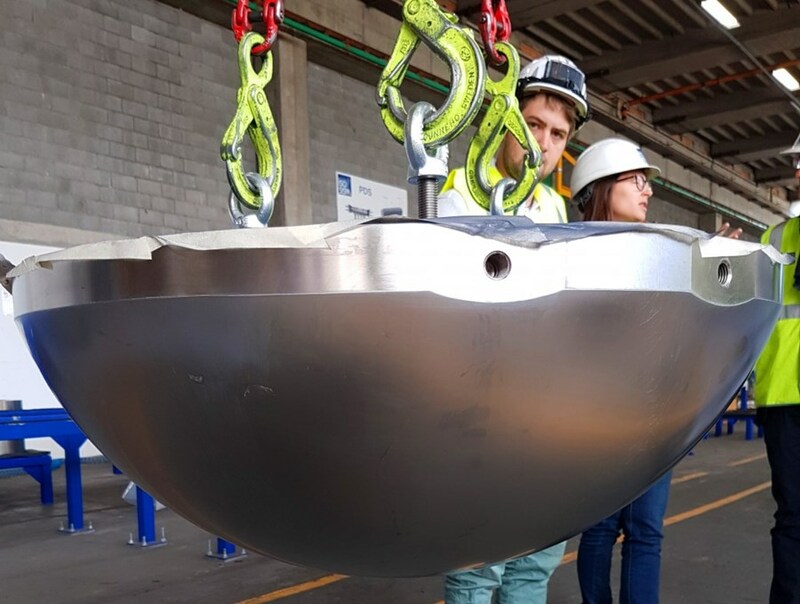 The mission, on behalf of the Buildings, Infrastructure and Power Supplies Project Team BIPS, was to "witness" and validate the assembly process of the different elements that make up a bearing. The parts making up the ball of the bearing (the semi-spherical "lens") and the socket (lower and upper backing plates, sliding material) are precisely assembled before being tested in a powerful press tool specifically designed for ITER's needs. The different parts of the bearings are pre-assembled before getting ''squeezed'' by a powerful press tool. The first results have shown that bearings withstand the pressure as required, without compressing more than 2 mm. The press will apply an axial force of close to 22 meganewtons (approximately 2,500 tonnes) to the bearing, representative of the actual load the Tokamak would exert. "Under that tremendous pressure, the 750-millimetre-high bearing must not compress more than two millimetres. This is very difficult to achieve but the first series bearings passed the test," explains Gjoklaj. The assembly process and procedure was deemed satisfactory by the two BIPS witnesses—with "a little fine-tuning here and a bit of optimizing there ..."
Production of the cryostat support bearings should be completed by March 2018, marking an important ITER Council milestone. Meanwhile, in the Tokamak Building, work is ongoing to prepare for the construction of the crown beginning in early 2018. As a fastening system for the bearings, a steel transition piece will be half embedded in the concrete crown during the first phase of pouring. Then, a high-strength top plate (3.5 tonnes of steel) will be positioned on the transition piece to receive the bearings with a mechanical blocking mechanism worthy of a Swiss watch. Permitted tolerances for the different elements of the fastening system will be less the 2 mm.